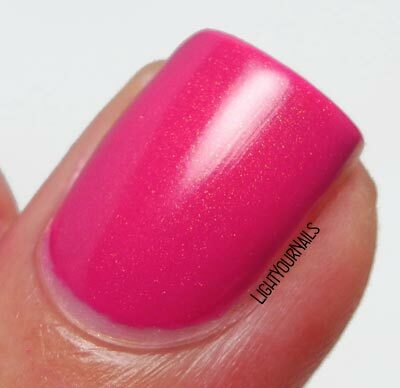 Sinful Colors Cream Pink | Light Your Nails! Today I am showing you a nail polish that hides a little secret. I purchased Sinful Colors Cream Pink because it shows some golden shimmer in the bottle despite its name. And you know, I can never resist golden shimmer! Application was easy and coverage is quite good with two coats. If you have longer nails you might do three though. That golden shimmer is not as visible as in the bottle but it doesn’t disappear completely either. Drying time is really quick. So what’s that secret I was mentioning? Sinful Colors Cream Pink is a satin/semi-matte nail polish! I was so surprised when it started drying to this finish. I love it but it’s not that popular. Plus nothing on the bottle said it had special finish of some sort. Photos: two coats, no top coat + macro shot to show the shimmer. I added top coat for my last photo hoping the golden shimmer would show more. It actually almost disappeared making the shade change a little, too. I can’t say I bother because I really loved it semi matte. What do you think of it? Do you usually like opaque or semi opaque nail polish?